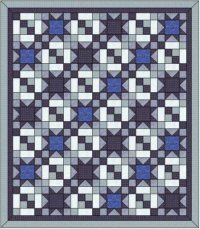 Many beautiful quilts have been made by combining two different alternating blocks. There are several design techniques to consider when doing this. Firstly the two blocks should differ in the complexity of their design - one being simple and the other more complex. Secondly when using pieced blocks both blocks should have the same number of divisions, for example both should be either 9-patch, 16-patch, 25-patch etc so that where the blocks seams intersect they match thus creating more patterns within the quilt. When using blocks with the same number of divisions the benefit is that the diagonal lines of the quilt become prominent. If you are not wanting a diagonal look then using blocks with different divisions is fine. Below are some simple blocks that work well alternating with other blocks and their patterns for you to use when creating your next quilt. Below are two examples of how these blocks work in quilts. 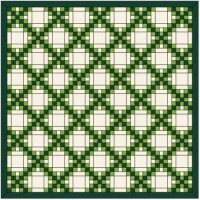 The first is Double Irish Chain Quilt that uses two blocks both using a 5x5 block (25-patch block). The second is Saw Tooth Quilt that uses three blocks. All three blocks are 4x4 block (16-Patch block). Notice the strong diagonal feature of both quilts.